While working around the shop yesterday, the iMac stopped suddenly. We have the sound output connected to a good set of Altec Lansing speakers so we can have music piped into the shop area via iTunes. It had been in screen saver mode with the tunes going for quite a while when all of a sudden there was quiet in the shop. You need to restart your computer. Hold down the Power button for several seconds or press the Restart button. There is nothing really innocuous installed on this iMac. Other than the software that came with the OS, there is Microsoft Office, Microsoft Messenger which has yet to be punched through ISA, and a Parallels installation with a Vista Business VM. 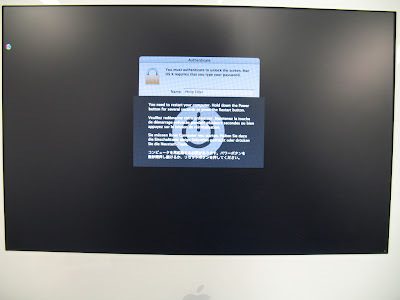 Up until this system lockup, the iMac has been running steadily with only a few other application crashes. When updates require it the iMac gets rebooted. This happens a couple times a week from what we can tell so far. Essentially, it has been running constantly since we bought it. 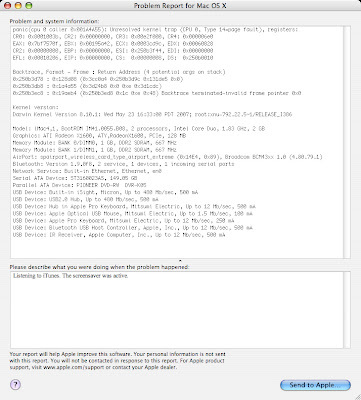 So, it is becoming a little clearer that even Macs have a few glitches.